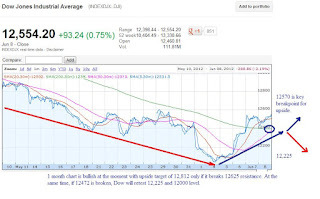 Where is Dow heading between Jun 11th - Jun 15th ? 100 point rally or 550 point sell off. 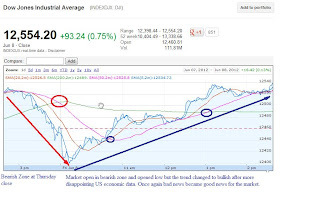 This article is continuation of last week article Where is Dow heading between Jun 4th - Jun 8th ? 400 point rally or 1000 point sell off. Last week Dow gained, 435 points (3.59%), S&P500 47.52 points (3.73%) and Nasdaq 110 points (4%). Year to date, Dow is up 253 points 336 points (3.3%), S&P500 68 points (5%), and Nasdaq 253 (10%). Chart for June 8th: Dow opened low but the sentiment changed to bullish after disappointing US economic data supported the idea of further easing which lead to short squeeze ahead of weekend along with the news that Spain might ask for bailout. Technical levels to watch next week: A rally without consolidation can break and reverse all its gain as it happened with the gains made during Dec to May. Last week we saw similar rally without consolidation. There are high chances it will break down on any shock out of Europe. 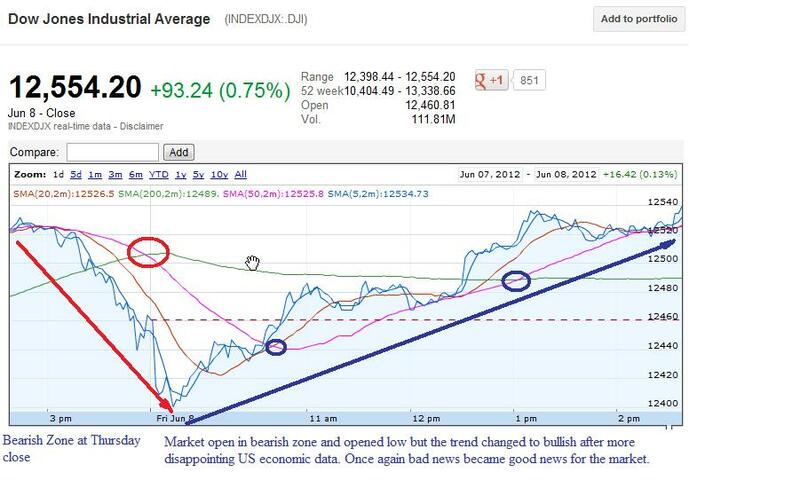 For bullish sentiment to continue, Dow needs to break 12,570 and S&P500 needs to bre ak 1340. 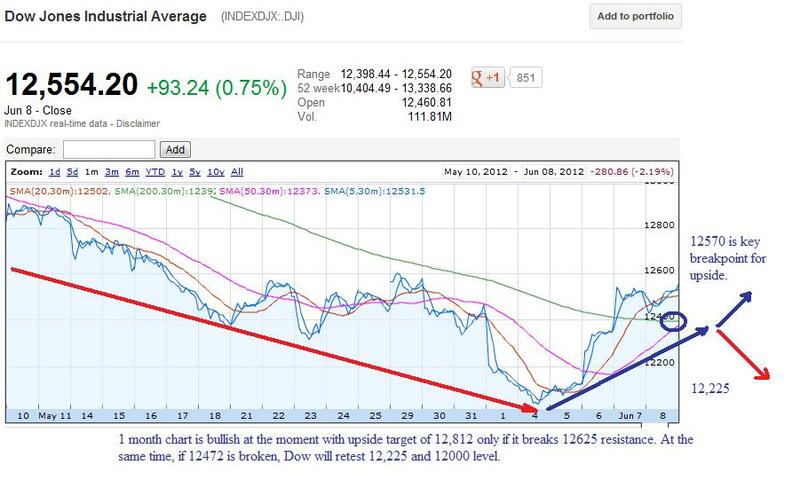 For bearish sentiment to continue, Dow needs to break 12472, and S&P500 needs to break 1308. We could see another 100 point upside this week. at the same time, if market remains negative on Monday and Tuesday, We could see 550 point sell off. 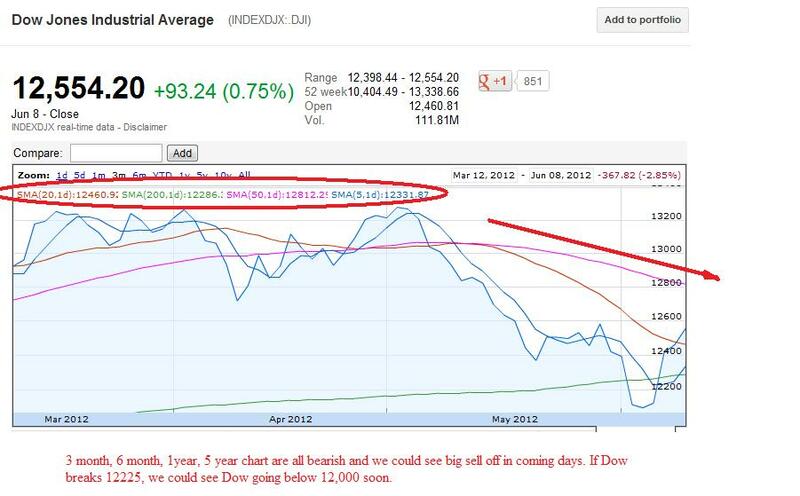 1 month Chart of Dow is bit bullish and if the rally continues max it can go is 12,812. At the same time if Dow starts selling off it will retest 12,225 followed by 12,000 resistance as overall trend is bearish. Based on 3 month, 6 month, 1 year and 5 year chart, all are still bearish and we could see big sell off in coming days. 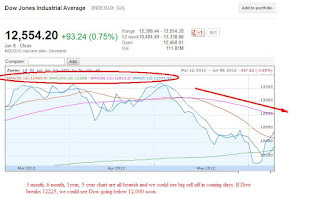 If Dow breaks 12,225 we could see Dow falling below 12,000. Today, Spain has asked for 125B in bailout for banks, and Euro group approved it. But the question remains where is the money ? EFSF has about 200 B. So if Spain gets 125B, that will leave 75B in EFSF. ECB 1 trillion effect was washed away in 5 month. So how long this 125B effect last. Market could react positively but I think its already priced in and we should see off on Monday. If you remember Cyprus is also want 15 B from EFSF to help its finances. Remember : Greece election is on June 17th and this will bring very high volatility in the market especially on Friday. If there is any potential of market to rally, its only on Monday and Tuesday. Rest of the week, we'll see sell off .